"Together we've made a difference," says Amnesty International of the court decision to release Born Samnang and Sok Sam Oeun three weeks ago. "They didn’t do it, I believe, as a result of some suddenly acquired respect for the rule of law," writes Shane Enright, "they reacted as a consequence of the persistent protests of Cambodian workers, supported by Amnesty and union activism and the unwavering spotlight we put them under." Brad's "detailed investigative journalism," he adds, "has helped keep the public spotlight on the case." Absolutely. That investigation is what you and millions of others will see in Who Killed Chea Vichea?. You, and millions of others around the world -- and the government of Cambodia knows it. The two men, released from prison pending retrial after the Supreme Court cited discrepancies in their case, joined civil society leaders in laying wreaths next to a portrait of Chea Vichea and issuing calls for an independent investigation into the labour leader's death. 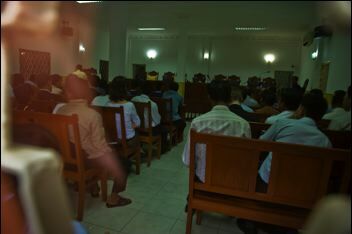 "I am very happy that I have opportunity to pay my respects to the spirit of Chea Vichea," Born Samnang told reporters. "I want to tell the people and the international community that I am not a killer. I hope the government will not allow the criminals to continue their activities against the people of our country." As the anniversary approached, there were indications that the retrial of Samnang and Sok Oeun in appeals courts, as ordered by the Supreme Court, could be approaching. However, it appears the authorities have not said when the trial might take place -- and as long as there's no trial, Samnang and Sam Oeun will remain free but with 15 years of prison time hanging over their heads. Meanwhile, just as Mony said, the real murderers are still out out there. History isn't what has happened. History is what is known to have happened. Five years ago today, Chea Vichea, the outspoken leader of Cambodia's garment workers, was shot down on the street in Phnom Penh. Within minutes, Bradley Cox was there with his camera as police swarmed the scene. Born Samnang and Sok Sam Oeun were arrested only days later, and Brad was there. The framing of these two innocent men started his five-year journey to record history as it happened. "Who Killed Chea Vichea?" isn't even finished yet, and it's already having an impact. 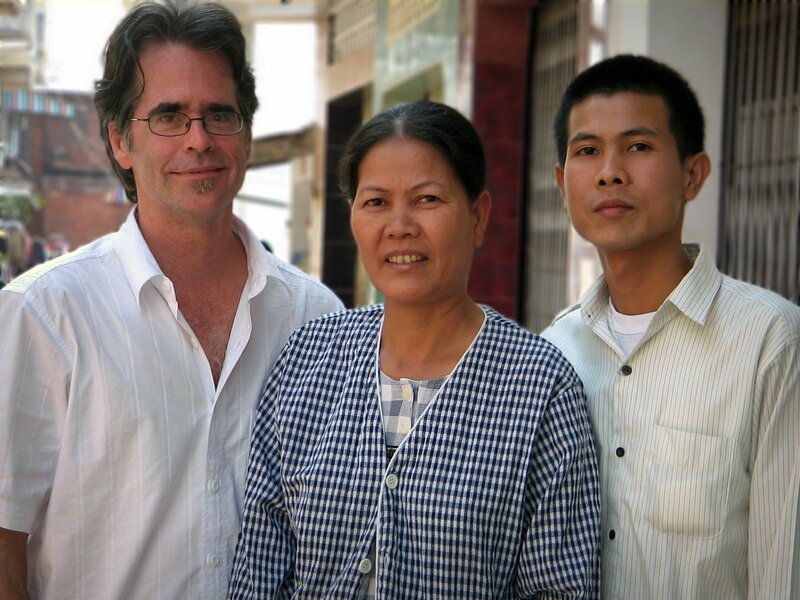 Samnang and Sok Oeun were released by the Supreme Court three weeks ago, after five years in prison. And again, Brad was there to film it. While it's impossible to know for sure why Samnang and Sok Sam Oeun were released, many observers have told us that the film must have played a big part in the decision. The government was well aware of it, and the government relies on foreign aid. But their names have not been cleared. The case against them has gone back to the appeals court. Meanwhile the real killers are still out there. The same is true of the killers of human rights advocate Om Radsady, radio announcer Chor Chatharith, actress Piseth Pilika and many others who have found themselves on the wrong side of power in Cambodia. 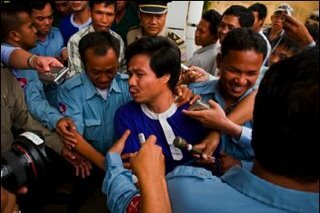 As long as these crimes go unpunished inside Cambodia and unknown outside Cambodia, fear will continue to rule. This film is meant to help change that fact. We need your help now to finish this film and make history. A typical documentary of this scale costs $400,000 to $600,000. We are making our film for half of that. Beyond putting in our personal resources and countless hours of work, we are making every additional dollar count. Why? Because like you, we're passionate about the truth. We're passionate about this case and we're passionate about human rights in Cambodia and around the world. Thank you for your support. May the new year bring justice and joy. This work made me more determined to fight in this highly unbalanced war. Compared to Vichea my sacrifice is much much less. How can I remain idle for Vichea's cause? Once again thanks for your help for the cause of my country. Your work has an incredible value. One day, we will be able to give him the credit he deserves, along with all the other Cambodians who risked their own safety to help make this film. Your support now can bring that day closer. January 22nd will mark the 5th anniversary of the assassination of charismatic trade unionist Chea Vichea. Born Samnang and Sok Sam Oeun, for their part, only just dodged their fate of yet spending another day behind bars. Both men were convicted of murder and condemned to spend 20 years in jail, but the highly unpopular verdict of their guilt left many unsatisfied. Lack of credible evidence... Trial marred with irregularities... On December 31st 2008, the Supreme Court ruled, much to the amazement of the audience and many, their release on bail. The American film-maker Bradley Cox took a deep interest in the case at its beginnings and set out to lead his own parallel investigation. For four years, he tracked down witnesses and clues and eventually put together a dossier in the form of the thriller-like documentary film “Who Killed Chea Vichea”, due for release this year and for which the film-maker still seeks financing. 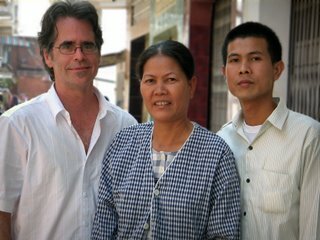 Bradley Cox gave an interview for Ka-set in Phnom Penh. "Looking back later, we would hope that this is when the Cambodian judiciary turned the corner. ...But we can't say this solves the problem. One case doesn't make or break a long pattern of deeply entrenched impunity," said Sara Colm of Human Rights Watch. ... Suon Sareth, executive secretary at the Cambodian Human Rights Action Committee, shared Colm's wait-and-see approach. I arrived at the Supreme Court at 7 a.m. A lot of photographers and journalist friends of mine were already waiting there, but no one was very optimistic about what was about to happen in the next few hours. I couldn't find a single person who thought that Born Samnang and Sok Sam Oeun would be released that day. I had to include myself in that too. The two men arrived shortly before eight. Since cameramen and photographers aren't allowed inside the courtroom, we were only allowed a few seconds to take pictures as they were hastily brought inside. Photo © Peter Harris; used by permission. It resembled a rugby scrum, but this was one occasion where being taller than the average Cambodian really comes in handy. Almost a hundred people waited outside, including twenty-five members of Sok Sam Oeun's family. Officials from the American, French, Swedish, German and Australian embassies listened to the proceedings inside. The hearing went on all morning, much longer than everyone expected. Everyone was confident that the court would delay its decision for another day when less media would be around. Why have an audience when delivering bad news? To everyone's surprise, after about four hours, there was a recess, with a decision to come afterward. About an hour later, the verdict was announced. Born Samnang and Sok Sam Oeun were to be released! It was a complete shock to everyone. No one could believe it, people were giddy, even the guards were smiling. Sok Sam Oeun's mother, who had barely said a word in all the time I've known her, was talking non-stop. And in the five years I've known Born Samnang's mother, it was the first time I ever saw her smile. There was just one last problem, getting the paperwork done so that Born Samnang and Sok Sam Oeun could be officially freed.In the meantime they were driven back to the prison. Photo © John Vink; used by permission. And it was a lengthy, bureaucratic process. Supreme Court justice Dith Munty had to sign an official document ordering their release, then it had to be delivered to the Ministry of Interior and signed off on and then brought to the warden of the prison for his OK (plus a few other steps that I can't quite remember), all before Samnang and Sam Oeun could actually be set free. The folks at Licadho (the human rights organization that has championed their case from the outset) was anxious to get them out the same day since the next day was January 1, a holiday when all government offices would be closed. After five years in custody for a crime they didn't commit, it seemed just plain wrong that they'd have to wait another two days for the paperwork to go through. But by 5 pm, the documents were still in transit and nobody was quite sure where they were. But the resourceful Licadho staff pulled a few strings and at 7 pm, Born Samnang and Sok Sam Oeun were released. I very much wanted to film the moment of their release and their re-uniting with their families. But the sky was dark, there were no lights and it had started to rain. Prison officials refused to let me shoot inside the prison and once the two men had stepped outside, it was like stepping into a sea of black ink. I couldn't see a damn thing. I thought I had lost the moment, gone for the lack of light or even a moon. It was then that Born Samnang's mother insisted on bringing her son to the pagoda to cleanse him and wash away the bad events of the past five years. Photo © Loud Mouth Films 2009. So we all went to the wat. And then there was light. A meager neon light but it was enough. A Buddhist monk, smoking like a chimney, sprinkled holy water on Born Samnang and Sok Sam Oeun as they kneeled side by side. I thought this was largely a figurative ritual but no! The monk lit another cigarette and proceeded to hose them down with a garden hose. For a full five minutes. Can't get too clean. The water was freezing, their bodies were shivering, their teeth chattering and Sok Sam Oeun was laughing hysterically. Afterwards, the parents dried them off and it felt as if the two families were one. It was finally time for them to go home. I had anticipated a kind of "Midnight Express" ending where the son is finally reunited with overjoyed family members. But there was no exuberant celebrations, no boisterous outbursts and it was was so much better. It was a good way to end the year. And it's all on tape and pretty soon, you'll see it all.